It's no surprise that consumers turn to digital—especially mobile—as they shop for a car. 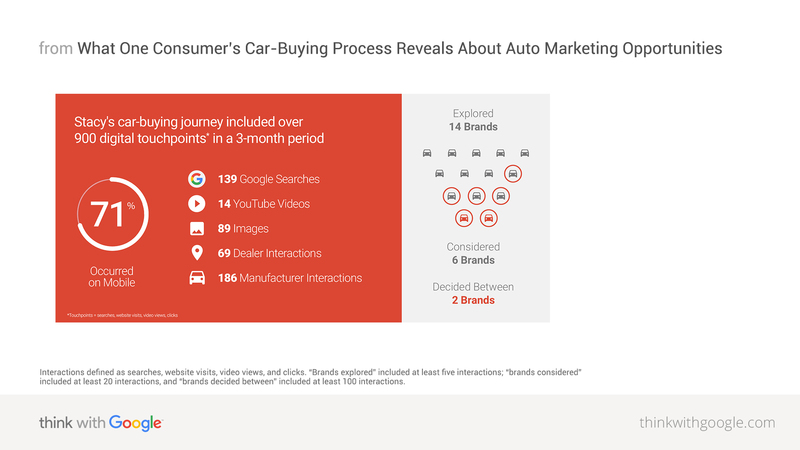 But thanks to new data from Luth Research, we can see exactly how (and how much) digital shapes the auto customer journey. Check out the 900-plus digital interactions one consumer had leading up to her lease. Auto marketers know that the average research timeline for a new car purchase can span months. Within that time, countless intent-driven micro-moments occur when consumers turn to their devices to answer a question or to address a need. 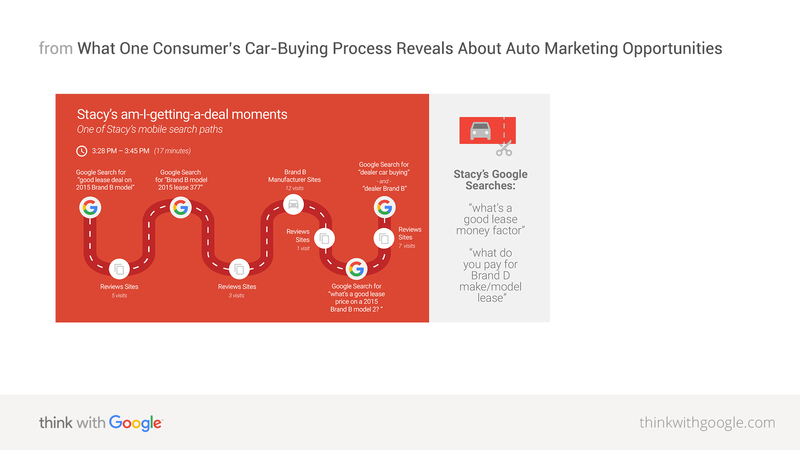 Whether it's a question about which car is the safest, which will fit a family of five with all their gear, or what the lowest monthly payment can be, these intent-driven moments are often Google Searches; and how auto brands respond in these micro-moments shape car buyers' decisions. But what exactly happens during those months of research? What types of exploration do consumers conduct? What do actual micro-moments look like? Through new clickstream data provided by Luth Research's opt-in panel (illustrating the order and pages a user visited), we are now able to answer those questions by analyzing the searches, clicks, website visits, and video views that make up one individual's path to purchase.1 The result is a granular view of how the key auto shopping moments play out in one consumer's car-buying process. Stacy is a 32-year-old mother of two. At the time of her search, she drove a mid-size SUV that fit her family of four. But with a third child on the way, she needed a new car that would fit three car seats, and so she had to decide between leasing a larger SUV or going with a minivan. 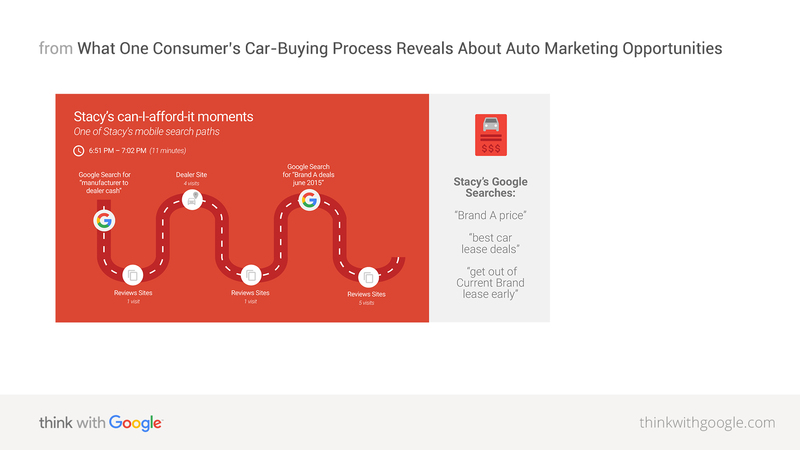 During the three-month period leading up to her decision to lease a car, Stacy's research included over 900 digital interactions where she intentionally sought out information related to an auto lease or purchase. 71% of Stacy's digital interactions occurred on mobile. These interactions—which took the form of searches, visits, video views, and clicks—were on Google, YouTube, manufacturer websites, dealer websites, and review websites. Interactions defined as searches, website visits, video views, and clicks. “Brands explored” included at least five interactions; “brands considered” included at least 20 interactions, and “brands decided between” included at least 100 interactions. In those which-car-is-best, is-it-right-for-me, can-I-afford-it, where-should-I-buy-it, and am-I-getting-a-deal moments, Stacy turned to Google Search. Throughout the course of her research, Stacy conducted 139 Google Searches. Those are 139 instances where she intentionally sought out information, presenting 139 opportunities for auto marketers to meet her there with relevant and useful content that could shape her decision. Here we walk through what those micro-moments looked like for Stacy, with examples of her actual mobile search paths and resulting actions. Six out of 10 car shoppers enter the market unsure of which car to buy.2 Stacy started out focusing on family friendliness and safety, which led her to consider several brands and models. As shoppers start to weigh practical considerations (like seating capacity and number of airbags, for instance), they start to determine their checklist of important features. Stacy's checklist included fitting three car seats and a sliding middle row. As shoppers narrow down their options, cost consideration comes into play. Stacy explored pricing and payment options that were right for her, including: price points less than $30,000, comparisons of leasing vs. buying, lease exchange programs, and the trade-in value of her current SUV. Though much of the car-buying process has moved online, the visit to a dealership remains a crucial step for many car buyers. In fact, search interest for "car dealerships near me" has doubled in the past year.3 As Stacy explored nearby dealerships, she also considered local inventory, deals, and specials. Though many am-I-getting-a-deal moments take place at the dealership, Stacy spent time researching deals both on the lot and off. She researched lease money factors, read about how she might forgo a dealer altogether, and crowdsourced actual prices paid for different brands and models so that she could show up prepared. Ultimately Stacy leased an SUV that met the criteria she was searching for in her micro-moments. In her own words: "My most important criteria were number of seats and cargo space to fit my whole family and all our gear." 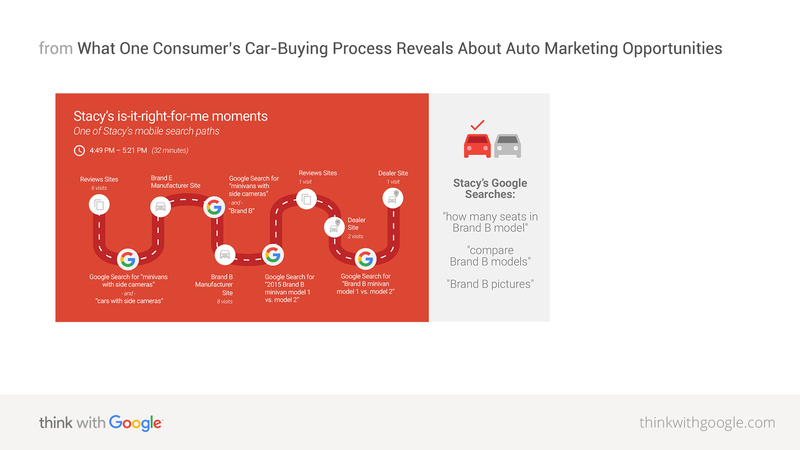 While Stacy is just one person, she is one of many auto shoppers looking to find the answers to their questions in micro-moments. 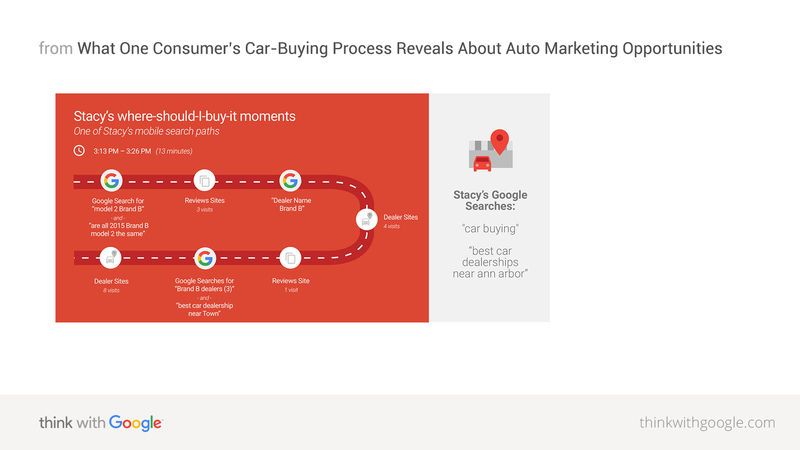 Each of her 139 Google Searches, and the hundreds of interactions that followed, represent a series of opportunities for auto marketers to be there and to be useful. As a starting point for your brand, think about how you're meeting potential car buyers like Stacy across the key auto shopping moments. Is your brand there? With the majority of the car-shopping process moving online, and increasingly on mobile, it's crucial that you be there when and where people are looking. Does your media plan make it easy for someone like Stacy to find answers, especially in search? Is your brand useful? Beyond just being there, consider how useful your brand is. Does your brand answer the questions Stacy had about safety, seating capacity, and price? Do you make it easy to compare across models and competitor brands? And most importantly, since the majority of Stacy's research happened on mobile, are those answers optimized for a mobile experience? Are you holding your brand accountable for connecting in these moments? Make sure you're measuring your brand's share of these key moments. Are you incorporating all of the potential outcomes from mobile research—online and offline—into your attribution model? Are you accounting for the impact that mobile has on sales? Have you tested the impact of increasing mobile budgets in order to quantify the lift in sales? 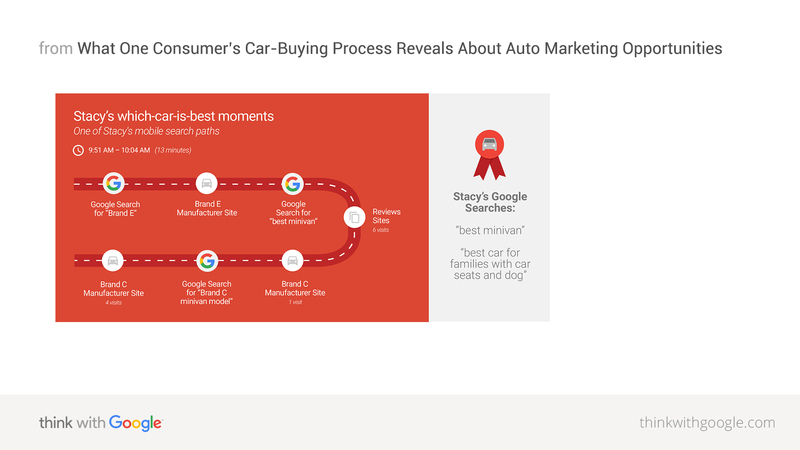 For a more comprehensive look at the consumer trends behind the auto shopping moments, check out "The 5 Auto Shopping Moments Every Brand Must Own." 1 Methodology: Google partnered with Luth Research. Luth analyzed the digital activity of its opt-in panel participants. This article details the cross-device clickstream data of one individual named Stacy over a period of three months. 2 Automotive Shopper Path to Purchase, Millward Brown Digital and Polk, September 2015. 3 Google internal data, U.S., September 2015.